My affliction seemed as well timed as it could be. I would go out on top. One week before the onset of symptoms, I had my best finish ever (third fastest) in a six hour adventure race where we competed in 37 deg. C heat. The day after symptom onset, I was in full denial mode and won my team classification in a six hour orienteering race. At almost 52, finishing uninjured by the cut off time is a realistic goal. Finishing near the top or winning is out of the question. On my nightstand, the latest New Yorker magazine contained an article detailing the lack of benefit from massive intervention to advanced stage cancer. Many medical professionals agreed that hospice care resulted in no diminishment in life remaining and certainly a far more comfortable decline. This finding corroborated my belief that my time left, to the extent I could control it, would be marked by vibrancy and not a drug addled struggle to prolong breathing. Admittedly, no one thought that I was going to die. 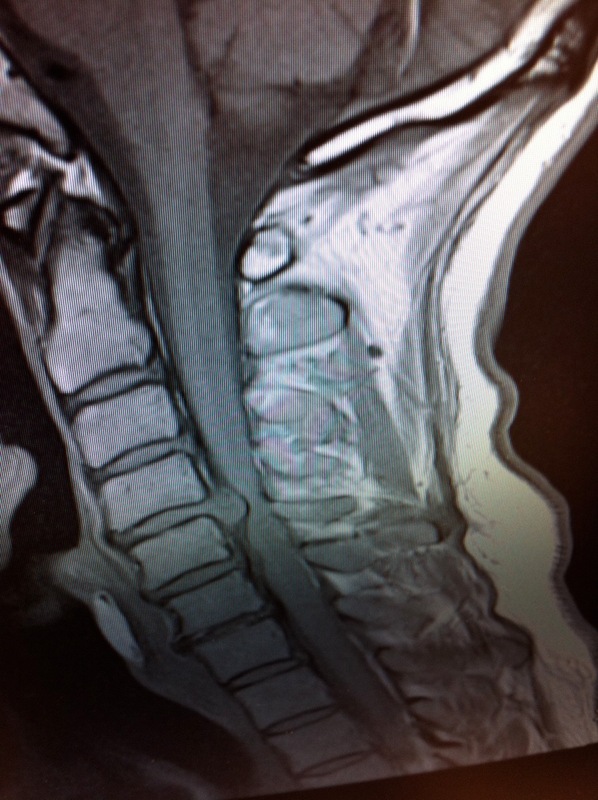 I had a disk between C4 and C5 in my cervical spine that was severely bulging into my spinal cord. In several places, my spinal cord was compressed into ribbon. You could have pushed me over with a feather. He reckoned that normally I would want to research procedures, doctors and medical centers, but in my place, he would not wait an instant. He consulted his next day’s surgery schedule and offered to cancel the morning operation and substitute my case. His canceling another neurosurgery operation forced reality on a previously surreal situation. Medical consumerism would never outweigh the potential harm from spinal cord injury. Scarily enough, the precise condition that was so concerning to the neurosurgeon had already been acute for a month. It took that long to weave my way though the US insurance-driven necessity of a GP visit, physical therapy, another GP visit, an MRI and another GP appointment. On top of that, I had to enlist the help of a neurosurgeon friend to get a neurosurgery consultation in less than two months. During this time, I had sneezed, coughed, driven, had kids hanging around my neck and orienteered. Ignorance had been bliss (with a healthy chance of paralysis). I took him up on this offer for next day surgery. 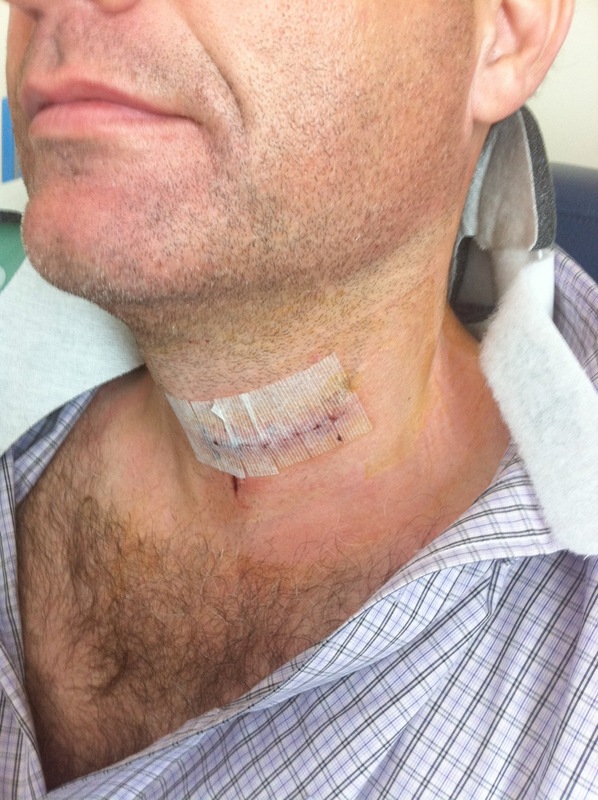 The procedure involves making an incision in the neck, moving the esophagus and trachea to the side and getting to the cervical vertebrae from the front. The surgeon remove the bulging disk, replaces it with cadaverous bone and screws a bracket to the surrounding vertebrae to secure them while bone forms and the vertebrae fuse. In my case, they removed two disks and bracketed three vertebrae. One loses the flexibility of the joints, but there is still much movement available elsewhere in the cervical spine. The physical recovery has been pain and trouble free. The "flirting with death" part has been the larger matter. My current work/family/leisure balance results in my physical vitality being the key to all other happiness. I crave serious exercise and have taken up endurance bike rides as my next physical challenge. Not only was all that extraordinary activity in danger from my impaired condition, but also I was slowly losing my fine motor skills -- like buttoning shirts, tying shoes and typing. When the activities of daily living become a challenge, this condition risks becoming the defining event in one’s life. The traumatic realization that I had a “near miss” with life defining quadriplegia was pretty terrifying and is only starting to fade. 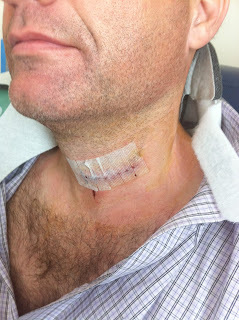 I am now three weeks post surgery. My numbness has gradually declined and fine motor skills are coming back. While I am making progress, it has been at a slow enough rate to appreciate the unfortunate alternative. I do not want to over dramatize, yet this is precisely the physical condition I mean when I, lightheartedly, had hypothetically balanced my quality of life versus euthanasia. I joke with my 8 year younger wife and 42 year younger kids that they will not need to pick out a nursing home for me because I will have topped myself before moving in. I have an agreement with a friend that if I am on a respirator, he will pull the plug when the nurse is not looking. I promised to do the same for him. Perhaps my life has been so worry free that I am excessively self absorbed with this close call. Maybe. However, my principal learning from counseling has been that my problems do not amount to a hill of beans in this world, but my problems are my problems. As the old people say, “If you have your health, you have everything.” More germane to vibrant souls like ours is not to waste a day, an hour, or a minute. Shorten your time horizon. Take that day off, do that bike ride, do an extra push up because you can and for heaven’s sake, take nothing, not a walk, a jump, a ride, a lift, even shoe tying, for granted. God forbid the "time coming," but at least you will have no regrets. Thank you Dean and Joad, for that. Things get taken for granted too easily. Hope you're both on the mend from your different malaises. Joad, I missed you on the last day of Tour of Britain. Catch you another time.